A defiant Carles Puigdemont says he’s confident the Catalan independence movement will prevail as he joins Alex Salmond, an outspoken proponent of Scottish departure from the UK, on Salmond’s new show set to premiere on RT. 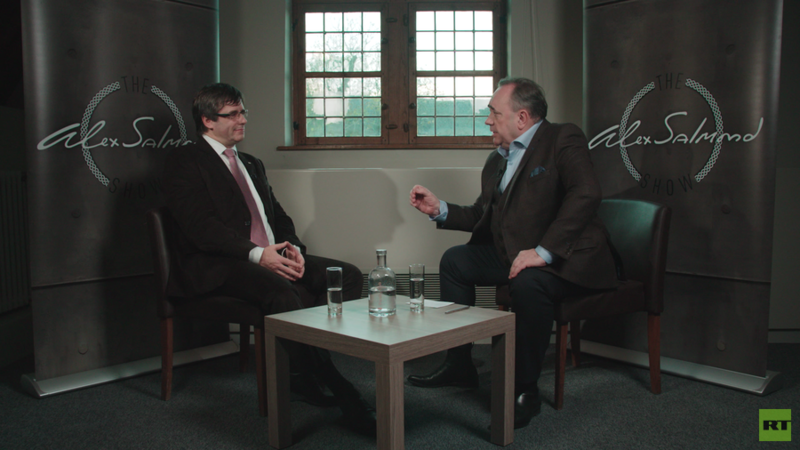 Puigdemont, the first guest to appear on RT’s ‘Alex Salmond Show’, said it was a very tragic yet emotional day on October 1, when Catalans overwhelmingly supported the ‘yes’ campaign to secede from Spain. When asked by Salmond about the Spanish police violence in wake of the independence vote, Puigdemont recalled “a lot of injuries” in a school in his own hometown of Girona, which was just one example of how polling stations across the region were viciously attacked. However, the deposed president of Catalonia, whose political fate is overshadowed by an extradition warrant issued by Madrid, told Salmond the independence cause will prevail.